A 1919 Bangor victory celebration. In 1920, the Soldiers Record Publishing Association released a three-volume set titled, “Soldiers of the Great War.” This compendium contains pictures organized by state and territory of the more than 117,000 American men and women lost in World War I. Major American universities, Harvard and Michigan State among them, have digitized this collection and made it available online. The Raymond H. Fogler Library at the University of Maine in Orono still has this memorial collection available for circulation. When looking into the eyes of each soldier and sailor pictured and wondering what it must have been like for them in those days, one has a better sense of their hardship. They answered America’s call to “make the world safe for democracy.” They were ready to make the sacrifice for freedom, and they did. Most Americans today seem to know little about these times. Yet from this war and its aftermath, the seeds of three wars were sown: World War II, the Korean War and Vietnam. World War I turned out not to be the “war to end all wars,” but rather to be the beginning of a century of conflict. A massive victory parade was held in Bangor shortly after Nov. 11, 1918. Thousands cheered as hundreds of troops and dignitaries marched through downtown. 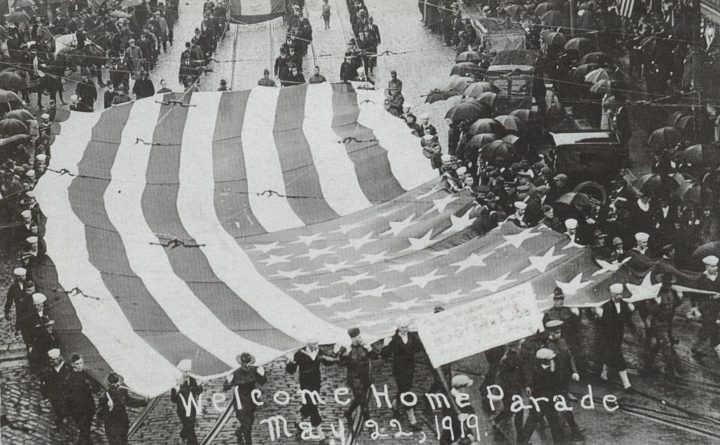 The parade rivaled the jubilant “Patriotic Day” of April 1917. Still, 18 young men from Bangor and three from Brewer did not return from the war. The harsh realities of the Great War soon began to sink into the American consciousness. President Woodrow Wilson’s Fourteen Points and its inherent concept of national self-determination was a hard sell for many European belligerents mired in centuries of colonial rule and subjugation of peoples. Was this aspiration and ideal just for Europeans? A young revolutionary traveling to Paris from the Far East attempted to see Wilson and others to seek freedom for his people; they would not see him. His name was Ho Chi Minh. The horrors of the world’s first modern, technological war turned Americans from further world involvement. Trench war became a state of military entrenchment in the United States in the 1920s and 1930s, where defense budgets were slashed by Congress. Americans isolated themselves from the world. A German delegation sought an armistice to the fighting; the combatants agreed that the fighting would cease at the 11th hour of the 11th day of the 11th month. It was not a surrender. Those terms would be hammered out in Paris, resulting in the punitive Versailles Treaty, which, it could be argued, resulted in the future war deaths of many young Americans. A prescient co-ed writing an editorial for the Oracle publication at Bangor High School in 1919 thought the terms of the treaty to be unfair to Germany. Most Germans agreed, particularly one named Adolf Hitler. The United States did not sign the Versailles Treaty but made its own treaty with Germany in 1922. Sewall became governor of Maine during World War II and served under Gen. Lucius Clay as a military governor in post-World War II Germany. He was also a close personal friend of Eddie Rickenbacker, America’s “Ace of Aces” and pioneer of modern air passenger service. Yet, the media did not report on this honorary exhibit. As the centennial of World War I comes to a close, take a look at the “Soldiers of the Great War” collection. Maine lost more than 1,000 young men and women “here” and “over there,” many from disease and accident as well as combat. Look into the eyes of these young men and women. This will help to personalize their story and sacrifice for you.